How Starbucks Saved My Life!!! I read a number of books in the last couple of weeks. One among those was ‘How Starbucks Saved My Life’ by Michael Gates Gill and it did strike a different perspective on life, though very mildly. A life that has suddenly switched from one of prestige, power, money, glam and glitz to that of an ordinary common man, a barista at Starbucks. It is the sweet bitter story in the first few chapters which transforms into a bitter sweet tale in the later half of the book. It’s the story of Michael Gates Gill who was born in a highly reputed family and was son to Brendan Gill, well-known writer for the New Yorker. Gill’s early life was all that one could aspire for, education at Yale University, job at the prestigious J. Walter Thompson advertising agency, acquaintance with Ernest Hemmingway and other crème de la crème in the field of literature, etc. You name it; he had it, all the symbols of modern day success and badges of material accomplishments by the time he was fifty. One fine day J. Walter Thompson un-ceremonially dismisses him, thanking Gill for his service for more than two and a half decades. A high profile executive is now unemployed and that too at a time when he discovers that he is a new father with a woman he had an affair with and needs to take care of a little girl. The affair brings an end to his twenty-year marriage and he is isolated from his former wife and his children. Life comes to a sudden halt as Gill is also diagnosed with a small tumor in his head. Depression and cover of darkness dominates Gill’s life. With no money, no health insurance, and no prospects, one day Gill spends his time in a Manhattan Starbucks with his last affordable luxury “a latte” brooding about his misfortune and how to take care of his little baby girl. Something magical happens and a young African-American woman asks the suit clad Gill if he is looking a job. Gill accepts the offer without a second thought and later learns that the godsend, 28 year old young woman, Crystal, is a Starbucks manager. Once on job floor, Gill undergoes a major shift in life from commanding an army of advertising specialists to scrubbing toilets, making coffee, handling the cash counter and doing other day-to-day activities at Starbucks working with a team of young African-Americans. Gill, the only old white guy in the team begins to see life from a different perspective, appreciates the harsh realities of survival, and also rectifies his ingrained prejudices related to many aspects. Respect and kindness become his crutches, when his entire armor of entitlement had been stripped away. Gill learns from his co-workers who are half his age in their mid twenties, that ‘gratitude’ and ‘will to fight’ doesn’t follow any equation having color, class, race, religion, age, skin pigmentation, language, or gender as variables. Crossing over the Starbucks bar was the beginning of a dramatic transformation that cracked Gill’s world wide open. 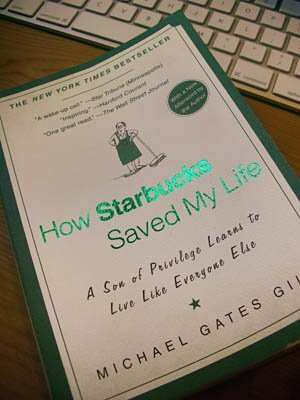 That’s the pulp of the storyline and so the name ‘How Starbucks Saved My Life’. The book was a Ok Ok read though and I finished it in two sittings. At times I found that stories and the tales that Gill, the former corporate shark spews at regular intervals in the book were a bit kitschy. The author has spent page after page explaining how the utopian corporate culture of Starbucks transformed his life, the repeated theme of working with African-Americans, etc. While reading the book, I found these opinions were over done, often giving the impression that it was a Starbucks promotional pap impersonating as a memoir.